An investor/team who doesn't have the capital to fund a deal? A New Investor who wants to learn how to pitch your deals? Looking for partners to help creatively carry a deal? Seeking a private equity partner to fund? 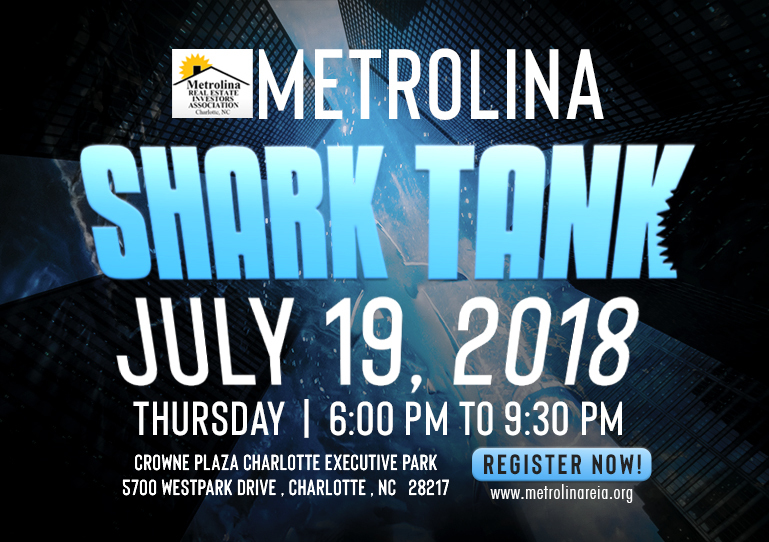 This event gives beginning investors the opportunity to pitch their real estate property investment opportunity to the “SHARKS” and get instant feedback, and possibly a deal. Want to Pitch your deal? If you are interested in submitting a deal, Metrolina REIA is now taking submissions from all Members and up to 6 participants will be chosen. 5. Pictures of the property in jpg format. No more than 20. 7. Proof of equity in the property: (proof of ownership or valid option/purchase contact). All information will be kept confidential. If selected to enter the Shark Tank, you will be notified. Be prepared . . know the facts of your deal . . .
Be confident & likable - these sharks will be working with you one-on-one sharing their knowledge and funding, so it's important that they like you and that you show you have done your homework. Practice - the more you practice your pitch, the better prepared you will be to pitch your deal to our panel of Sharks, but remember we have Sharks each and every month at the Metrolina RIEA meeting - so always have your current deal ready to go . . . you never know where or when you will find your own personal Shark. Who should pitch their deals at this Event? Investors with a current deal that needs funding . . . Wholesalers who have a great deal . . . buy it yourself by Partnering with a Shark. Wholesalers / Agent with a great deal . . . sell it to a Shark. Investors with a long term funding needs. . . it can be a past deal to show track record for a future deal. And it does not have to be just a house . . . . bring us your multifamily deals or note deals. This is an opportunity to improve YOUR pitching skills as shark participants receive on-the-spot feedback, delivery techniques, and strategies for immediate improvement.